Crowdfunding is one of the biggest buzz words of the last five years. But while platforms like Kickstarter and Indiegogo have helped the likes of Pebble, Oculus Rift and the Canary cam project find their way into mainstream consciousness, I believe that crowdfunding has had its day. Sure, there are still some potentially groundbreaking ideas landing on the platforms – but they are buried beneath a deluge of non-starters, high-profile pre-order campaigns and, most worryingly, pie in the sky bogus pitches that have no chance of seeing the light of day in the real world. Every week on Wareable we update our pick of the most exciting projects seeking backers' cash. With so many new wearable tech and connected self products hitting the sites each week, it's a job just sifting through the potential wheat from the obvious chaff. There's a tonne of clear non-runners. PetPhone - the world's first personal music player for pets… what the? A $125 Android Wear smartwatch with 3GB of RAM and 32GB of storage… clearly not gonna happen. Silver anti-radiation underwear… just, no. The trouble – and the reason I'm losing faith in the whole shebang – is that more often than not, even after carefully considering what campaigns to cover (frequently campaigns that also receive widespread media coverage elsewhere) the projects end up with disappointing endings. Successfully backed campaigns often end up being massively delayed and shipping months (or even years) later than expected (see Skully AR-1, Fineck and Kokoon). 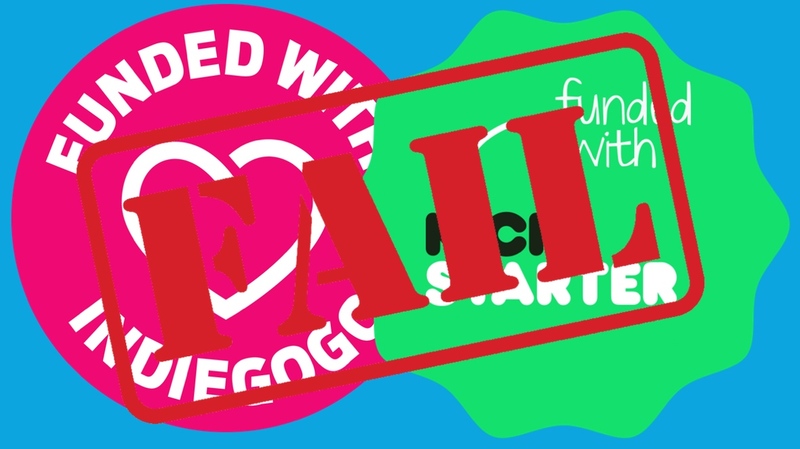 And as we're noticing more frequently, projects that smash their goals never materialise, leaving backers frustrated and out-of-pocket, despite promises of refunds (see Hiris, AmpStrip and Boldr). Worryingly, Indiegogo has no qualms in letting projects go live that have already had a run, and been successful, on Kickstarter. That baffles me. Kuai Sport Headphones featured as one of our weekly crowdfunding picks when the original campaign went live on Kickstarter. The group behind those contacted us to ask why we weren't covering its new campaign on Indiegogo. Why would we? Why would we recommend to our readers that they back a secondary project when units from the original project have missed the November 2015 shipping estimate by six months and counting? Crowdfunding is key for startups that may not otherwise have a stage big enough to shout about their ideas. But it's just not working at the moment. Kickstarter is stricter, on paper at least, than Indiegogo – but the measures it takes to make sure backed projects become real world products clearly don't work. The whole thing needs a total rethink. Another reason I think that the Kickstarting era is coming to a close is the success Pebble enjoys on the platform. Why is Pebble still crowdfunding? Behind Apple and Samsung, it is the most successful smartwatch company on the planet (despite reported money worries) so why is it still launching products onto a site that, in that site's own words "helps artists, musicians, filmmakers, designers, and other creators find the resources and support they need to make their ideas a reality"? Does Pebble really need resources and support to launch more smartwatches? Couldn't it just set-up pre-orders on pebble.com and raise the cash it needs that way? You know, like a normal company would? It's nothing more than a big PR charade, and I'm bored of it. I'm bored of it all. I'm bored of the clearly fake products. I'm bored of the big ideas that don't live up to the hype. I'm bored of the delays and mountain of negative feedback comments. I'm bored of the phrase "Pebble smashes Kickstarter record". Still, make sure you bookmark Crowdfund this – our weekly pick of the best tech projects seeking your backing. It goes live every Wednesday.